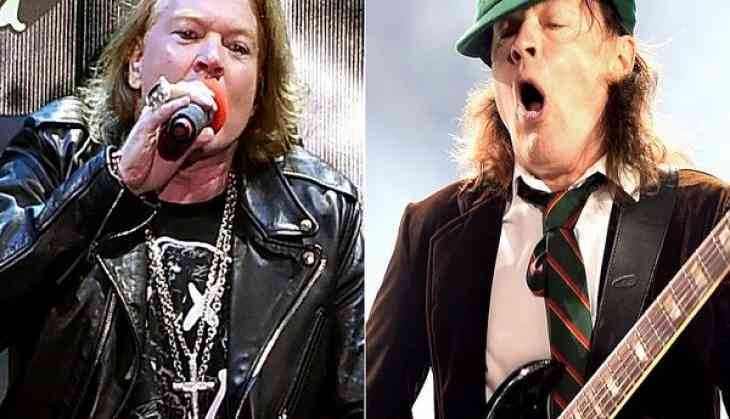 Legendary guitar player Angus Young is reportedly at work on a new AC/DC album with Axl Rose. In recent years, Rose has learned his services to the band as touring singer, after Brian Johnson was forced to retire from performing after suffering from hearing loss. Angry Anderson from the Australian band 'Rose Tattoo', who was recently interviewed by 'The Rock Pit', revealed that Young told him he is writing a new AC/DC album with Rose expected to sing lead vocals. "I was talking to Angus earlier last year when we were doing the encores and we were opening for Guns 'n' Roses, but Angus and I were asked to do the encores and I said to him 'What are you going to do?' and he said 'Mate I'm writing a new album'," he said. "I thought 'cool' so I asked him who was in the band and he said 'Axl'." Following the sad death of founder and guitarist Malcolm Young, as well as the departure of Johnson, Phil Rudd and Cliff Williams, AC/DC have been through an incredibly tumultuous period over the past few years. "There are these people, and yes it's sad that the original line-up isn't there anymore but it's the songs, people who have supported them all the way through their career they want to hear the songs," he continued. "And in a sense, we owe that to people, so really it's a debt of gratitude and what we're saying is you've stood by us, we'll stand by you."